Paul Ng has been photographing extensively since the late 1980's. His images have appeared in numerous publications including Outdoor Photographer, Shutterbug, American West, Wyoming Wildlife, Photog (Hong Kong), Fotoart (Hong Kong) and others. His works have been collected by many private individuals and public entities including Wyoming State Museum, University of Wyoming Student Union, Rock Springs Fine Arts Center. Ng's images have been exhibited in Wyoming Arts Council Gallery, Wyoming State Museum, Larsen Gallery (Yakima Community College, Yakima, Washington), Old West Museum, Rock Springs' Community Fine Arts Center and the Sweetwater County Library System. Paul is a devoted practitioner in large format black and white photography, even though he sometimes photographs in colors and occasionally with digital format in recent years. Ng processes all his black and white film and works diligently in his own dark room making traditional silver gelatin black and white prints. He has studied dark room techniques and filed skills with the renowned black and white master John Sexton, who was an assistant and consultant to the late Ansel Adams. 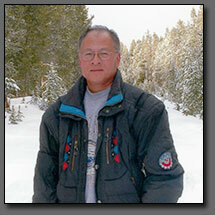 Paul has been an adjunct instructor in photography at the Western Wyoming Community College since 2002. ©Photography by Paul Ng. Website Design by Wyoming Network Inc.